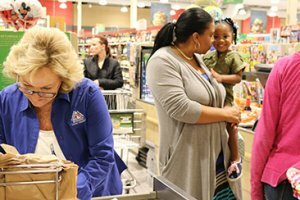 Farm Bureau volunteers statewide will be celebrating Food Check-Out Week, Feb. 19-23, a time of year when the average American has earned enough income to meet his or her annual cost of food. The average American household spends less than 10 percent of their disposable income on food. This is the lowest of any country. When applied to a calendar year, the average American earns enough income to pay for an annual supply of food in just seven weeks. By comparison, the same person must work until mid-April to pay for annual yearly income taxes. The average American is now at least three generations removed from the farm. To help better connect Americans with the sources of their food, clothing, shelter and energy, Farm Bureau volunteers will host various interactive community events statewide. Sample events include educational and food displays at local grocery stores, food drives and donations to various charities, such as Ronald McDonald House Charities. To find out what events are taking place in your community, contact your local Farm Bureau county office by visiting https://www.floridafarmbureau.org/county-farm-bureaus/.